The Dunn Solar Telescope in Sunspot, N.M. The site was closed for over a week after a security threat. People who work at the observatory, and those who live on the site, were asked to evacuate. The site's post office was also closed. The Otero County sheriff told the local newspaper that his office was alerted but not given any information. "The FBI is refusing to tell us what's going on," Sheriff Benny House told the Alamogordo Daily News shortly after the closure. "We've got people up there (at Sunspot) that requested us to standby while they evacuate it. Nobody would really elaborate on any of the circumstances as to why. The FBI were up there. What their purpose was nobody will say." "But for the FBI to get involved that quick and be so secretive about it, there was a lot of stuff going on up there," he added. "There was a Blackhawk helicopter, a bunch of people around antennas and work crews on towers but nobody would tell us anything." From there, it was off to the races. Combine the FBI, a powerful telescope and a location in rural Sunspot, N.M., and you've got all the ingredients for some rampant speculation — government surveillance, aliens, etc. "Why the FBI close the observatory?? People have the right to know!!" one person demanded on the observatory's Google page. The observatory, in Lincoln National Forest, about 170 miles south of Albuquerque, is home to the Dunn Solar Telescope. When it opened in 1969, it was the world's premier high spatial resolution optical solar telescope, the National Solar Observatory says. Though it's now considered a "legacy telescope," the Dunn "continues to be one of the most versatile, user-friendly setups in the world," the observatory says. New Mexico is already associated in some people's minds with unexplained phenomena. The observatory is about 85 miles southwest of Roswell, N.M., a town long at the center of UFO lore. So what did happen at Sunspot? "AURA has been cooperating with an on-going law enforcement investigation of criminal activity that occurred at Sacramento Peak. During this time, we became concerned that a suspect in the investigation potentially posed a threat to the safety of local staff and residents. For this reason, AURA temporarily vacated the facility and ceased science activities at this location. The consortium said that it recognizes that the lack of communication while the facility was being evacuated was "concerning and frustrating for some." "However, our desire to provide additional information had to be balanced against the risk that, if spread at the time, the news would alert the suspect and impede the law enforcement investigation. That was a risk we could not take," the statement says. And the helicopter? House, the sheriff, told The Washington Post that Black Hawk helicopters aren't uncommon in the area. A call to an FBI spokesperson was not immediately returned. A person at the bureau's Albuquerque office said he had no information and could not comment. The consortium said the site will have extra security for now, because of people showing up at the facility since its closure: "Given the significant amount of publicity the temporary closure has generated, and the consequent expectation of an unusual number of visitors to the site, we are temporarily engaging a security service while the facility returns to a normal working environment." 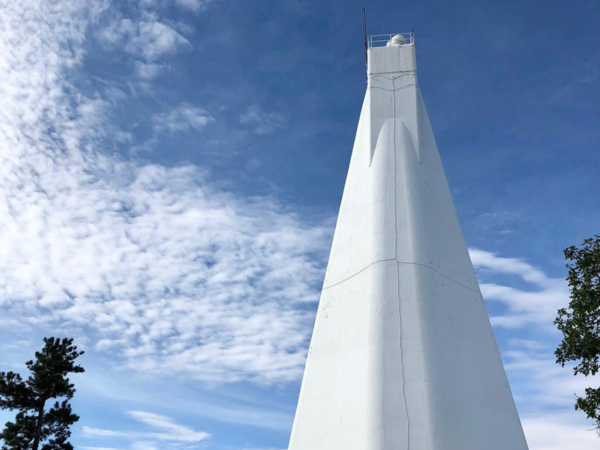 James McAteer, the New Mexico State University professor who leads operations of the telescope at the site, said he was impressed by the theories that people had come up with for the closure. "It was the first time I've had to deny contact with Aliens and Death-by-solar-storm and underground tunnels and New communications via X-rays all at one time," he wrote in an email to NPR. The observatory's reopening means that researchers can get to back to doing what they do: staring at the sun. "We cannot wait to get back to work to show everyone the world class research we do every day at the telescope," McAteer said.